With over 35 years manufacturing experience, Ascotex Limited is perhaps the leading authority in the field of yarn guides. On both textile and wire machinery the point of contact with the fibre or wire is usually the most critical factor in the yarn or wire production / treatment / manipulation process, strongly influencing friction and so consequently yarn or wire tension. Working closely with leading machinery manufacturers and many of the world's leading textile and wire producers, we have developed a range of guides to suit all applications. To cope with the greater abrasion from ever increasing speeds of machinery, the traditional hard Chrome plated steel is gradually becoming superseded by much harder (up to Hv1800) industrial ceramics such as sintered aluminium oxides and titanium dioxides; our latest material is polycrystalline sapphire, which as well as being very hard (~Hv2050) can be diamond polished to give an ultra smooth "mirror-like" finish to minimize damage to super-micro filaments. 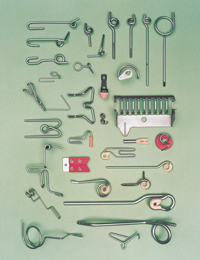 Complementing our range of guides, we also manufacture a range of accessories such as tensioning devices, break detectors and cutters. 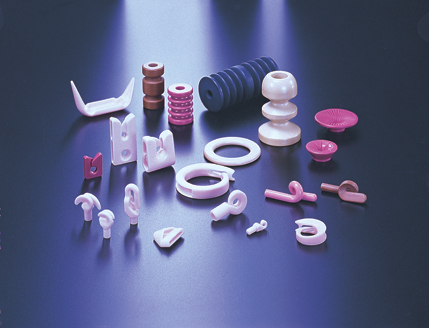 Metal Guides are not normally kept in stock due to the enormous variety of shapes and surface conditions.